The Bestway Foundation has donated £100,000 to the NSPCC, the UK’s foremost children’s charity. 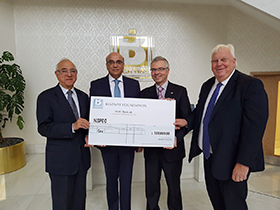 The donation took place at Bestway’s HQ in Park Royal on 22th November with Bestway Group Chief Executive Zameer Choudrey CBE and Bestway Wholesale Chairman Younus Sheikh presenting the NSPCC’s chief executive Peter Wanless with a cheque for £100,000. Photo 2: Younus Sheikh, chairman, Bestway Wholesale, Zameer Choudrey CBE, chief executive Bestway Group, Peter Wanless, chief executive of the NSPCC and Martin Race managing director, Bestway Wholesale.